Green building just got dramatically greener with the launch of a breakthrough log product that makes log homes twice as energy efficient as before. The first-of-its-kind in Canada, the Engineered Energy Efficient Log – or EEE Log – by 1867 Confederation Log & Timber Frame, more than doubles the R-Value of natural wood. R-Value is a measure of a material’s thermal resistance. The higher the value, the greater the insulating effectiveness. And with an R-Value of 26.5, the EEE Log is not only considerably more energy efficient than conventional log homes, but over 30% more energy efficient than newly constructed stick frame homes with a standard R Value of 20. The EEE Log also provides many additional advantages, such as uniform finish, that bring a different appeal to log home construction, said Kinsman. “Our quality system for building a log home – tried and true over 35 years in business – remains the same,” he said, noting that 1867 Confederation’s first EEE Log home – a 1,500-square-foot, three-bedroom home in Ontario – is already completed and the construction of a second EEE Log home in Quebec is well underway. “The EEE Log is a man-made alternative that combines the natural beauty of wood with engineered benefits you just can’t find in nature,” said Kinsman. Fully engineered and tested, the EEE Log is constructed using 1867 Confederation standard dry white pine. Carefully chosen planks of wood, free from insect damage, fungal stains or other physical defects, are laminated together with a structural bonding resin under very high pressure. The core is filled with high-density insulated foam, which accounts for the higher R-Value creating the most energy efficient log home. Manufactured logs have the same appearance as traditional logs, but will not shrink or settle over time. The likelihood of checks, splits or stains occurring in the wood is virtually eliminated and maintenance is minimal. Another benefit is that logs are straight and remain that way. 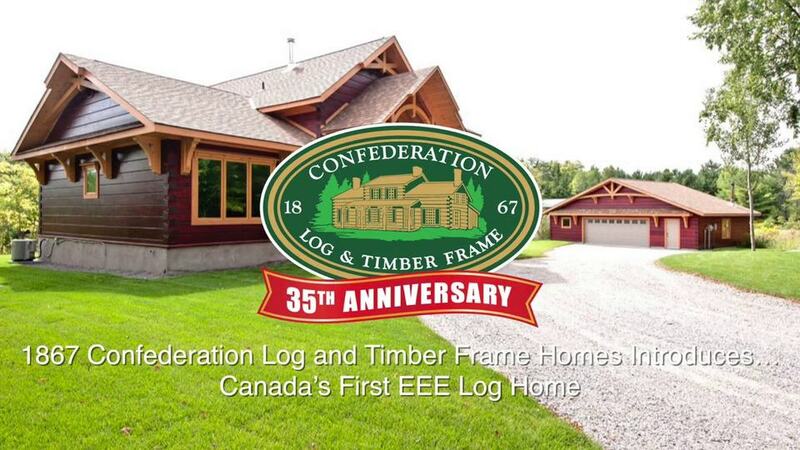 What sets 1867 Confederation’s EEE Log apart from other engineered products is the attention to craftsmanship. Whereas others bill themselves as logs, they’re actually pre-fab panels with wood adhered to the exterior, explains Kinsman. 1867 Confederation’s EEE Log, on the other hand, is treated the same as a natural log, complete with all of the benefits of the dovetail corner, spline system and other innovations developed by the company over the years.